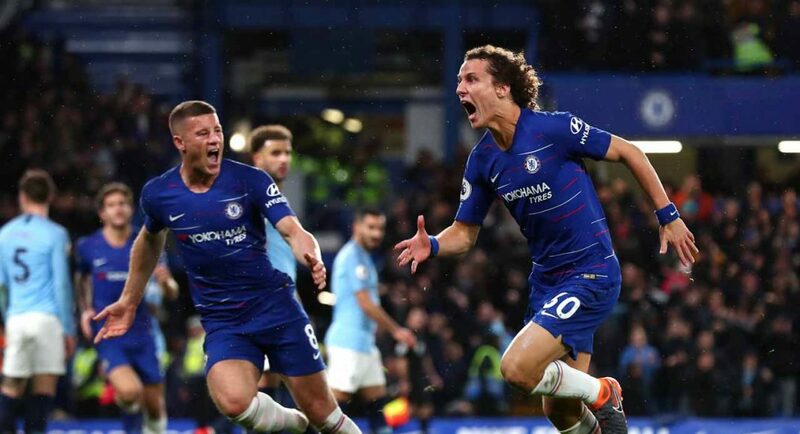 Chelsea 2-0 Manchester City - A fantastic team performance delivers an unexpected result. 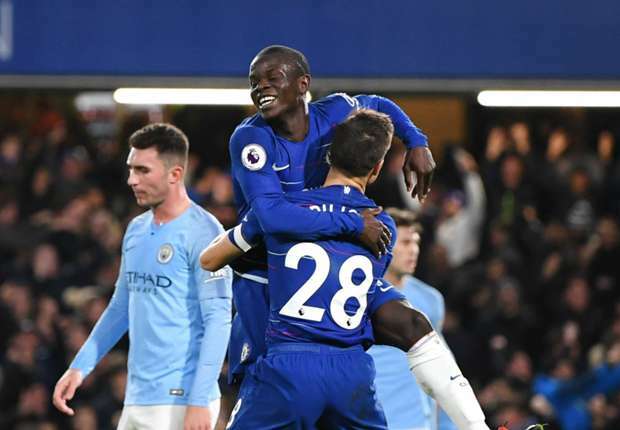 Chelsea beat Manchester City with goals from N'Golo Kante and David Luiz in a fine team performance at Stamford Bridge. With two defeats in the last three games in addition to poor defensive performances, no-one would have predicted what happened tonight. The regular readers of this website and my new Vlog on YouTube would know that I personally was dreading this one. Thinking back to how Tottenham ripped us apart and the last thirty minutes against Wolves in midweek; I could only see the best team in the Premier League putting us to the sword ahead of the game. I felt that if we let City get in-behind us we could get battered by Pep Guardiola's in-form side. So to my initial reaction when the team was announced ahead of the game. To say shocked and surprised would be an understatement. No recognised striker with Pedro, Willian and Eden Hazard all starting? Marcos Alonso starting bearing in mind Maurizio Sarri had revealed that he had suffered with injuries in the last week or so? I was disappointed. The thing for me about playing Eden Hazard up top leading the line is that you take away 50% of his game because he has to play with his back to goal. His game is all about collecting the ball in space facing his opponent to then take them on and beat them. In order for Hazard playing there to work today, we would need him to try and hold the ball up, to draw fouls and free-kicks to give us some rest-bite knowing that City will spend the whole game on the front foot and when he does have an opportunity to influence the game in/around their box he has to make something happen. He did exactly that! Let's be honest here, City did batter us with their possession in the first half. They totally dominated us with their high press without the ball and turned our initial high press into us defending deeper within 15 or 20 minutes. At times we looked like we were struggling but apart from a half-hearted attempt by Raheem Sterling from close range saved by Kepa in goal, City hardly created clear-cut opportunities. That was down to how well we were playing defensively. 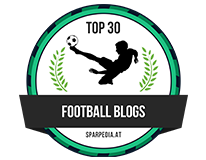 David Luiz often criticised when he loses his discipline in games became the same player of that in his first season back at the club - Antonio Conte's title winning season. He played with focus, he held his position and used the fantastic ability he has when he is switched on to read a game of football to put himself in good areas to make tackles/win headers. One major change in our shape was in midfield with N'Golo Kante and Mateo Kovacic playing closer to Jorginho when we did not have the ball. As we lose possession of the ball, these three formed an defensive line across the middle and ahead of the back-four. The impressive Pedro and Willian also worked hard without the ball to drop back alongside them forming five across the width of the pitch which made it difficult for City to break us down. 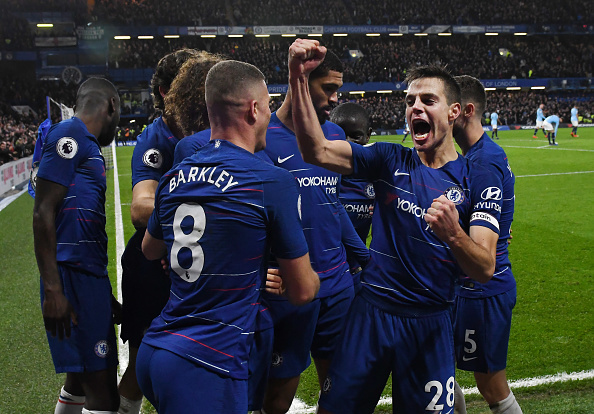 Maurizio Sarri spoke of how happy he was with the team's mentality here and I agree totally. It would have been easy for the players to become frustrated in those 44 minutes of the first half before our goal, chasing the ball down, being moved about and dominated. However, they didn't with each of the ten outfield players all knowing their individual roles and responsibilities that fitted into the framework of our team. OK it has to be said that City played well on the night despite not creating much. We also have to be honest about the times we gave the ball away in the first half putting pressure on ourselves. That needs to be ironed out as the season progresses but thankfully on the night it did not cost us. So to the first goal right on half-time. 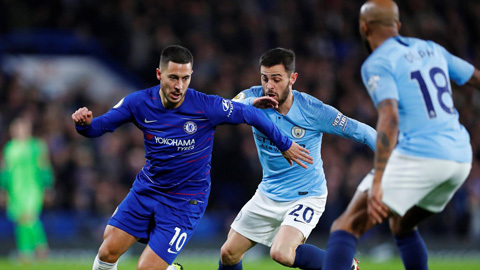 Now with City's high press which includes their full-backs joining in you could see that a ball over the top to Eden Hazard in behind their defence could be a solution to make them think twice, forcing them onto the back foot. The ball was always on but we never managed to sort ourselves out for 44 previous minutes and our possession was lost or simply broke down. David Luiz thought otherwise. He collects the ball in space for once deep inside our half just left of centre and sees Pedro literally hugging the touchline ten yards inside the City half and plays a raking 50-yard pass over to him on our right hand side and Pedro takes one touch to bring the ball down heading back inside. He spots Willian making a run down our left-hand side and plays the ball out to him. The attack reaches the edge of their box, breaks down but with City only half-clearing the ball, Marcos Alonso controls the ball, lays it out wide left to Eden Hazard just inside the box. 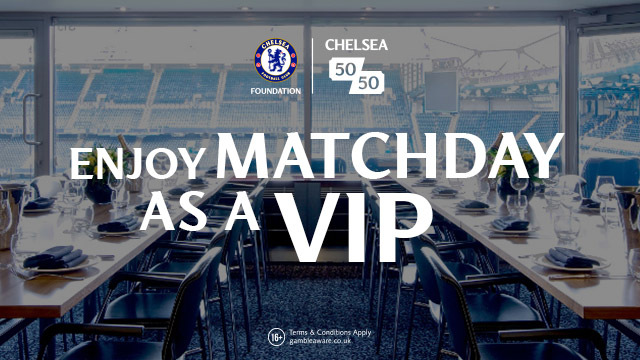 Hazard steps to his left and plays the ball back across goal towards the penalty spot for the on-coming N'Golo Kante who strikes the ball into the roof of the net to make it 1-0. At half-time heading into the break it felt the same as it did against Barcelona at Stamford Bridge in the Champions League semi-final first leg in the season we won it in Munich. On that night we had been dominated and had little time attacking them but for one moment when we broke on them with Ramires who crossed the ball into the box for Didier Drogba to slot home and eventually win the game. It felt like smash and grab from Chelsea on that night and did again here against City but of course we would take it all day long. So to the second half and no changes from Sarri. However, the team changed and we now started to dominate City which was good to see. We carved them open three-times in a fifteen-minute period with chances for Willian, Hazard and Willian again all saved by Ederson in goal. The impressive thing in all this for me thinking back is that we remained defensively solid throughout but at the same time we were more than expressive going forward whereas in the first half it was the complete opposite. Manchester City were the ones sitting deeper now, they were having to sit in a defensive shape and cope with our movement. At no time did we look in any danger apart from a Kepa save from Jesus after giving the ball away late on. City still tried to play their football but offered little in and around our box. Our defence were outstanding on the night with Cesar Azpilicueta up there with David Luiz for man of the match. Supported tonight by a willing cast in midfield who kept their shape throughout it was a 100% improved defensive performance to Tottenham. Chelsea wrapped up the three points with a great header from David Luiz from a set-piece down our left-hand side. As the cross came into the box, Luiz rose high moving away from goal and managed to direct his header towards the far corner. The ball hits the underside of the crossbar and into the net giving the goalkeeper and defender near the back post no chance to make it 2-0. His performance deserved the goal, it really did. As the final whistle blew, Chelsea had beaten Pep Guardiola's Manchester City side for the first time this season. We proved that they are human, they can be beaten and that any talk of an invincible season was thrown out of the window. To sum up, this was a totally unexpected result, an unexpected performance from the whole team and a fantastic result. This wasn't about individuals taking the glory but everyone buying into the team as a unit both with and without the ball which was the most pleasing of all. N'Golo Kante playing closer to Jorginho and David Luiz demonstrating discipline with focus on defending? Who would have thought!